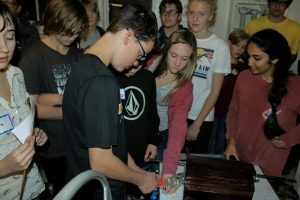 The October café for Science Discovery Teen Café took us on a journey back to a time that predates our sleek smartphones and slim laptops. This Halloween café was a hybrid lab tour and Escape Room where we got up close and personal with the clunky ancestors of our modern devices. The CU Media Archaeology Lab is home to dozens of computers from decades past, typewriters, vintage cameras, video game consoles and a large, hand-crank phonograph machine. 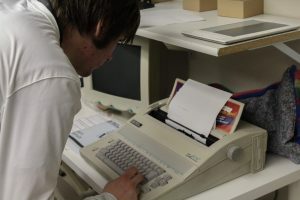 Visitors can disassemble an Apple II computer, go head-to-head on an Atari 2600 and copy documents on a 1960s-era mimeograph machine. We got a tour of the archive from Dr. Chris Torrence, who volunteers at the MAL doing restoration and repair. He’s also a former middle school STEM teacher, who used Basic programming to teach his students how to code, and who has written a modern book on the programmic language. In addition to the amazing tour, the Youth Leadership team helped design a super complicated and fun Escape Room based on the old school technology at the MAL. It was a super chaotic, but fun café. 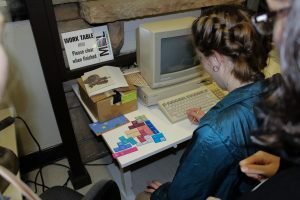 The activity for this café was an 80s Tech-themed Escape Room. Students were split into four color coded teams of 5-6 people. Each team was given an envelope with clues, and additional clues were scattered around the MAL. Some clues were built into the technology–a Mavis Beacon typing quiz that revealed one answer, a mysterious prompt on some paper in an electric typewriter that took one to a Cold War Era rotary phone with German instructions. 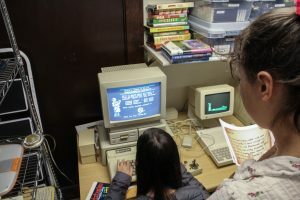 Students played Oregon Trail on an Apple IIE, a few rounds of Super Mario Brothers on a Nintendo, some Atari games, Tetris, and Zork in order to solve the clues, which were all different kinds of combinations needed to unlock a large box. Inside the box was another small box filled with candy and each team had to solve a final clue to unlock their candy reward. This café was a beast to prepare, but the Youth Leadership team met for a few hours one day to workshop the clues, and they were a great help in facilitating the café itself. A really fun time was had by all, as well as a deeper appreciation for the technology their parents had to work with when they were kids.